I should probably make this sound more professional, but I'm way too excited! Armor Grid Games & Miniatures proudly declares: "We have our first product!!!" 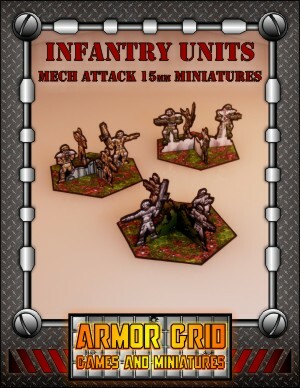 FREE 15mm Infantry Units for use in Armor Grid: Mech Attack or any other 15mm Sci-fi Wargame. Let us know what you think and please stay tuned- Armor Grid: Mech Attack! is on the way!!! SUH-WEET! Thanks a ton, WaffleM! Looking forward to the entire package. Any hints on how I could scale these up to 28mm? You could print them at 200%, but they'll probably be a bit pixelly. 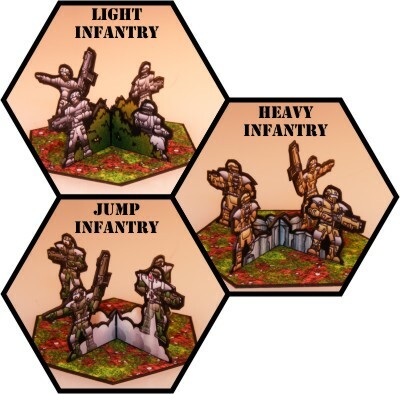 Not to worry, I'm working on a set of 30mm Infantry Minis and they should be ready in a few weeks. Does anybody remember this fine game ? I played it with friends and we painted alot of those micro space marines titan warmachines and vehicles. The game survived up to date and is called today Netepic. I'm glad you like them. Depending on what program you're using, you should be able to reduce/print them out at 40%. That should reduce the scale from 15mm to 6mm, but the cutting and assembly may require a magnifying glass and tweezers! Please post any pics. I'd love to see them! Of course. I will try my best. Thanks alot for posting them. I hope you could enhance this line with others - how about 2D warmachines? (like flying speeders or mortars or even tanks?) Would be great. Does anybody remember this fine game ? I played it with friends and we painted alot of those micro space marines titan warmachines and vehicles. Yes, I still have 5000 points worth of painted Tyranids. Unfortunately no friends, time or inclination to play it again. Well, not unless I have some long holidays. "This is my timey wimey detector. Goes ding when there's stuff."